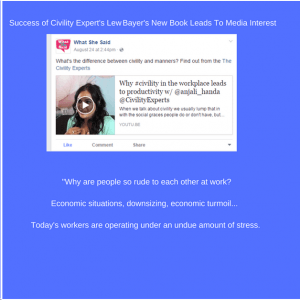 Civility Experts’ Toronto affiliate recently sat down with WHAT SHE SAID Radio hosts Kate Wheeler and Christine Bentley to talk about civility at work. The hosts asked, why are people being rude to each other? Anjali explained that things like downsizing, the economic turmoil many face, and similar financial issues are having an impact on people in the workplace – in a state of desperation, people often end up taking it out on people and environments around them. Workers today fin themselves operating under an undue amount of stress. When asked what the answer to the problem is, Anjali said that the answer is embedding civility in the workplace. Anjali said that civility can actually impact the bottom line – what businesses actually care about. Anjali points out that we are seeing increase in morale, engagement, productivity -things that all have an impact on the proverbial bottom line. Civility is the foundation of how we operate as a society. In a technical age things seem more focused on a bottom line, and what makes people operate harmoniously is starting to be looked at again.